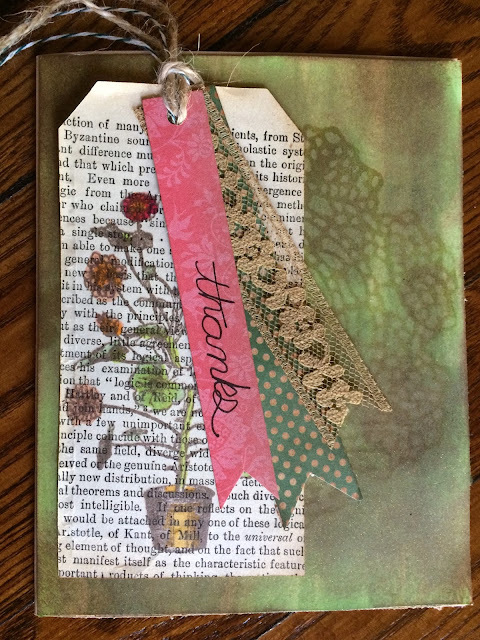 This whole card began when I was tidying up my crafting table and found this little bit of brown ribbon. It's actually old fashioned seam binding from some sewing things my grandmother gave me. That little piece of seam binding was the catalyst for this card which is why the card had to be vintage. I grabbed some white card stock from my scrap box and coated it with Distress stain in Mowed Lawn. To give it a more subtle vintage feel, I added some Distress Vintage Photo Ink. Then I set it aside to dry while I worked on adding some excitement to the background of this card. I thought to myself what could be more vintage feeling than a doily? And I just happen to have a Tim Holz doily thinlit die which I used to cut out the doily from some more white scrap. Holding the doily over my card I gave a healthy squirt or three of Tattered Angels Brand New Gold glimmer spray. When I lifted the doily, the effect was wow! The spray reacted with the ink and left a clear impression on the background along with a soft shimmer. The shimmer was subtle like Wink of Stella glitter pens if you've ever tried those. A paper doily would give similar results as well as a snowflake die. I saved the doily after it dried in the same envelope as the die to use another time or two. Now it was time for the star of the card--my Vintage Geranium Stamp. Diving in my scrap paper box again, I dug up some old book paper. 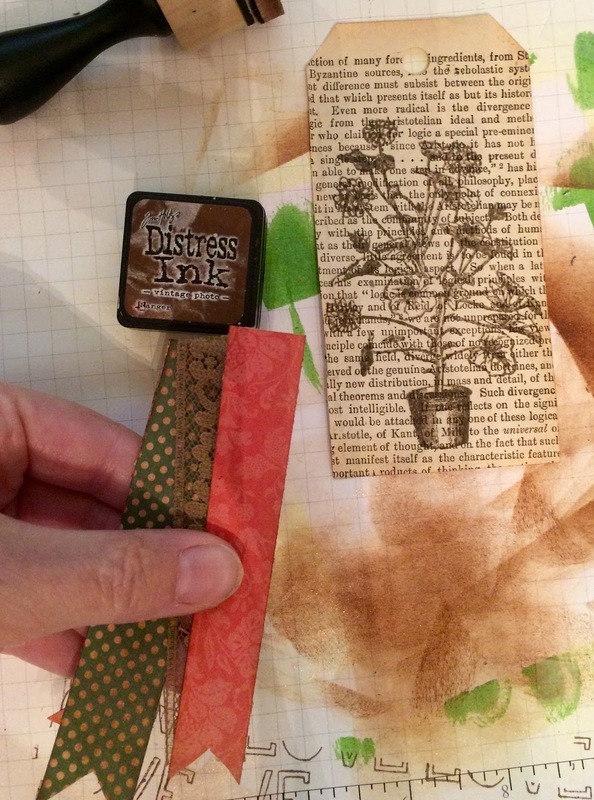 Using Rich Cocoa Memento Ink, I inked up my stamp and pressed it on the paper. When it dried I used Copic markers to quickly color it. For this project almost any markers would work. Just remember that old book paper is very dry so little color goes a long way. You may not believe it, but I beelined for my scrap paper box and found some complimentary papers to make little fish tailed ribbons. I punched the ribbons and the tags. I wrote thanks on one tag. I just wrote in cursive with my regular handwriting--nothing fancy as the card is fancy enough. Using twine I tied the card and pieces together. Then my favorite collage glue stuck the pieces together. I attached the front to some Neenah Kraft paper. I guess the lesson this week is for me: If I tidy up my craft room, inspiration might strike! Or feel virtuous and use those scraps! Tucked away in some corner of your craft area may lie a bit of inspiration for an amazing project.